Do you like candy hearts? Some people love them. Some people love to hate them. Me, personally, I love them! Even if you hate them, they’re a fun way to add a little Valentine’s twist to learning. 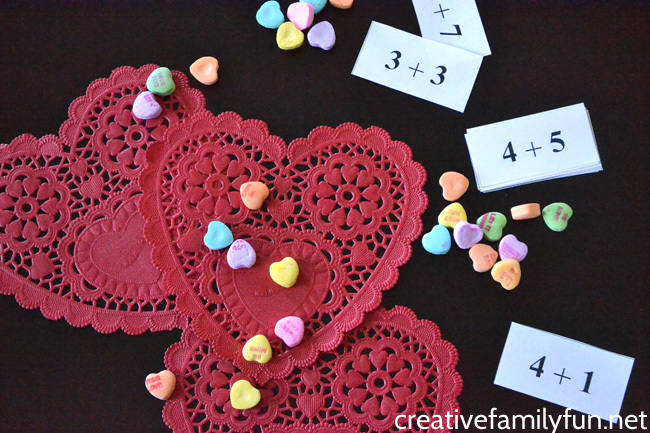 Grab a box of candy hearts and get ready to practice addition with this fun Valentine’s Day math activity, Candy Heart Addition. The concept for this activity is really simple. We’re going to use candy hearts as a math manipulative to work on our addition skills. You’ll need three heart doilies, some candy hearts, and a set of math problems. Pull your addition problems from the group of math facts your child is currently working on. Or, write down some problems from a homework sheet. This is a great way to use a set of flashcards sent home from school. Write your math problems on a few index cards if you don’t have flashcards. Once you have your math problems ready, lay out the three doilies and a pile of candy hearts. That’s it. This activity is ready to go. Grab an addition problem. Use candy hearts to put the correct amount on two of the doilies. In the example above, we need to solve 4+1. We put four candy hearts on one doily and one candy heart on another doily. 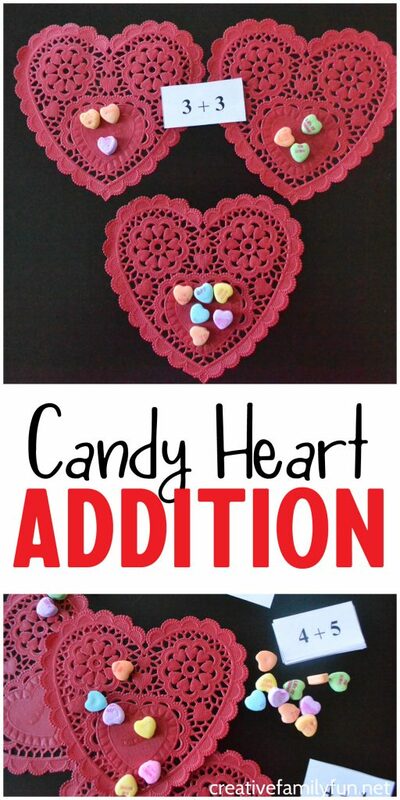 Add the two numbers together and put the correct amount of candy hearts on the third doily. Word through your pile of math problems using your candy heart manipulatives to solve each one. You can use this activity to practice subtraction too. It’s not just an addition activity. Use this activity to supplement whatever your child needs to work on. Make the activity a little harder. Eliminate the third doily and do the math without the manipulatives. This activity is a nice way to introduce the concept of addition. 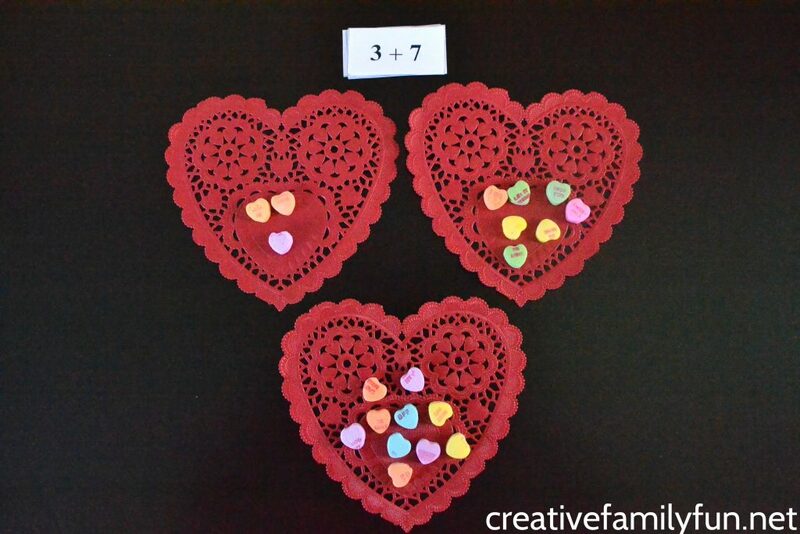 Demonstrate how you can count the candy hearts on the first two doilies to find the answer to the equation. 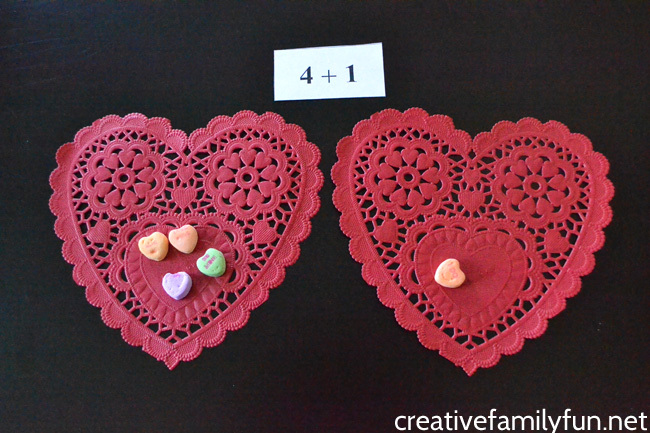 Grab your candy hearts for this fun Valentine’s Day math activity. 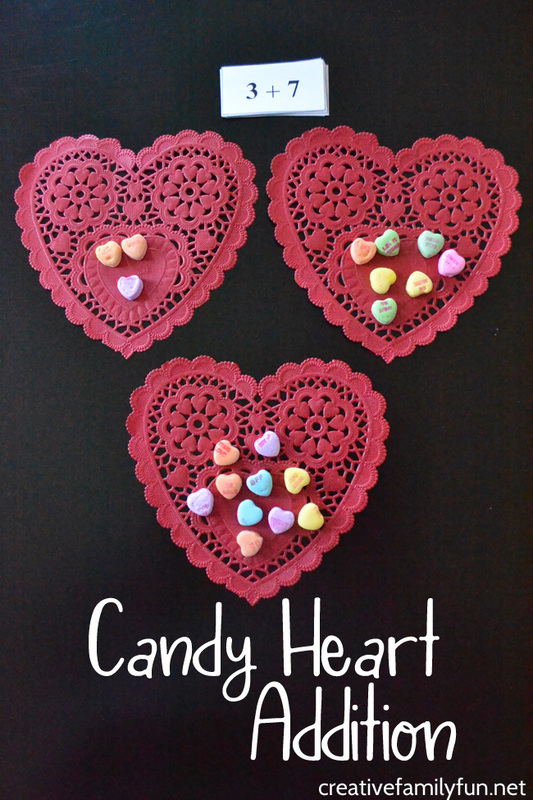 Candy Heart Addition is a lot of fun – and you don’t have to eat them if you don’t want to! We love using games to practice our math. Here are some great ones you’ll love playing.